Captain Mahendra Dhoni hit an imperious unbeaten maiden double Test century as India closed day three of the first Test with Australia 135 ahead at 515-8. India resumed 198 behind on 182-3 with the large crowd hoping Sachin Tendulkar would score the 29 more he needed to reach his 52nd Test century. But he added only 10 and it was Dhoni who dominated with 206 from 243 balls, featuring 22 fours and five sixes. He shared 128 in 26 overs for the fifth wicket with Virat Kohli, who made 107. The 31-year-old skipper is close to two records, the highest score by an Indian captain, currently the 217 Tendulkar made against New Zealand, and the highest score by a wicketkeeper, which is 232 by England coach and former Zimbabwe batsman Andy Flower. It was a magnificent innings, particularly as his team had scored only 14 runs in the opening 11 overs and lost Tendulkar to a sharply turning delivery from Nathan Lyon that gripped in the increasingly prominent rough areas and bowled the maestro between bat and pad for 81 as he drove. Dhoni twice hit Lyon for two fours in an over, and using his powerful wrists and fearsome bat speed to full effect, dispatched left-arm seamer Mitchell Starc for three boundaries in five balls. Kohli reached his second successive Test century, the fourth of his blossoming career, with a neat clip off his pads to the square-leg fence and his captain continued the counter-attack with some savage treatment of debutant seamer Moises Henriques, hoisting him over extra cover for six and two balls later walking down the wicket to smash him dismissively over mid-on. Lyon ended the partnership, of which Dhoni contributed 72, when Kohli tried to launch over the top and was superbly caught by Starc at mid-on. Wickets continued to fall but Dhoni kept the scoreboard operators busy, with two fours in an over from Australia's new fast bowling hope James Pattinson and two sixes in four balls off Lyon. 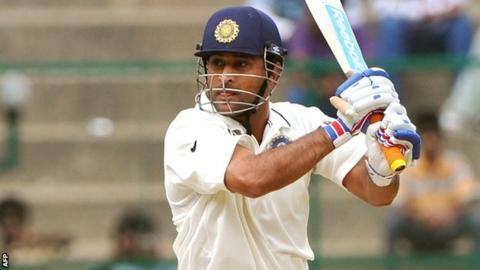 Dhoni had made five centuries prior to this match, his 74th Test, with 148 against Pakistan in only his sixth innings in 2006 his previous highest. His 206 runs were from a total of 319 scored on day three, and in a ninth-wicket stand of 109, partner Bhuvneshwar Kumar has made 16 thus far.